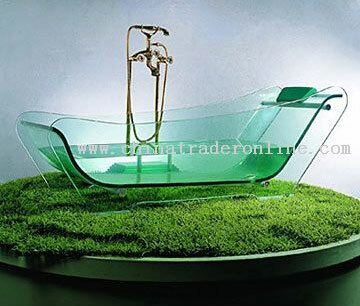 Indestructible Glass Bathtub Is Indestructible | OhGizmo! By Evan Ackerman on 01/20/09 • Leave a comment! It’s unclear who, exactly, this transparent bathtub is designed for… Someone who desperately needs both bullet-proofing and bomb-proofing in their bathroom, I guess. Maybe it’s that special tingle you get from being both exposed and protected at the same time. You’ll have to call China to get one of these, but at least the price is negotiable.